As I mentioned in the End of September report, I was able to get our rose bed on the side renovated this past week. It is far from done, but I at least was able to make a good start on it. In desperate need of water, among other things. All the bushes were roses. This is where it was by the end of August. The bushes had filled in some, and were even getting ready to rebloom, but not much else going on. In the past few weeks I dug up all but 2 of the rose bushes, weeded, added generous amounts of compost, and tilled it all in. Phew! The roses not staying will be spread out in other flowerbeds. So my color scheme for this bed is deep purples with pale yellows and oranges as counterpoint. Basically, the coloring of a purple pansy, now that I think about it. Since it no longer will just have roses, I have renamed it the Oval Garden. The rose on this side blooms in delicate orange with highlights of hot pink. I put groups of pansies all around the edges as filler, as you can see in front. I discovered it's hard to get a good picture of the agastache in the middle! The agastache there in the middle, or hyssop, is a hybrid called 'Heatwave." It's supposed to fill out to be 24" tall and wide. I put in 3 of them, so I'm hoping for a decent clump! Fuschia was not going to be part of my color scheme until the moment I saw these flowers. I think they go rather well--it echoes the highlights in the orange rose. I really like how airy they are--they almost look like they're floating above the roses. There's a second rose bush on the right in the back of this picture. Those blooms are a warm buttery yellow with orange and lighter pink highlights. The shrub in front on the right is one of two physocarpus opufolius (ninebarks) I put in. I've got one on each end, both 'Dart's Gold' variety. I had one in my back flowerbed in Washington. These leaves aren't very yellow right now, but that could be due to lack of sun exposure at the nursery. This bed gets plenty of sun, so I'm hoping they will give me that color here as a backdrop for the other things I have planted. Here at the far end of the bed, I put in a Montmorency pie cherry tree. It's on Mazzard rootstock, which is supposed to be more tolerant of heavy soils. This will eventually get quite large--20' tall and wide--unless I keep it pruned way back. For now I'll just let it grow. If and when it does get that big, I may have to move some things around in this bed, because it will no doubt shade the bed. Cross that bridge when I come to it, though. I'm just excited to have pie cherries next July! 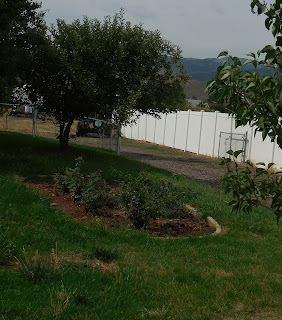 The small shrub to the left of the cherry tree is a 3rd rose bush, that I had dug up, then replanted. The shrub you can see behind the tree is the other ninebark. I've got six of these deep purple bachelor's buttons spaced out around the edges of the bed. These are Centaurea 'Amethyst Dream,' and should each eventually form a clump roughly 20" tall x 27" wide. I'm excited! I love these flowers! Then I also put in 3 Coreopsis 'Moonbeam' (tickseed) plants, shown in front here. They are a pale yellow cultivar; should be drought tolerant and bloom all summer. They should each form a clump 12-18" tall and 18"wide. Lastly (as mentioned) I put in a few groupings of pansies and violas. I love the color echoes going on here. I'm not expecting them to make it through the winter or reseed, but if they do I'll be happy. In the meantime, they're adding a few more spots of color and filling up some of the bare dirt. Oval Garden overview--looking toward the back yard. ...and a side shot, just for fun. I've got alliums, tulips, daffodils, and irises that I will be planting in this bed in the next few weeks--as soon as they arrive in the mail. Then I'll be done adding to it until next spring. Oh, as I was working, a painted lady butterfly came to pay the agastache a visit. Stay tuned as this bed develops!